"This recipe receives raves every time I serve it! The sauce will be a small quantity and very thick. Don't let that scare you! Baking or grilling the chicken is also an option instead of frying." Heat oil in a deep-fryer or large saucepan to 350 degrees F (175 degrees C). Preheat oven to 350 degrees F (175 degrees C). Fry chicken in the hot oil, working in batches, until no longer pink in the center and is crispy on the outside, 10 to 15 minutes per batch. Transfer chicken to a paper towel-lined plate using a slotted spoon; set aside until cool enough to touch. Stir margarine, hot sauce, garlic, onion soup mix, lemon juice, and basil together in a bowl until sauce is smooth. Put chicken in a large resealable bag; add the sauce, seal the bag, and shake until wings are coated. Spread wings into a baking sheet. Bake in the preheated oven until sauce has baked onto the chicken, about 5 minutes. 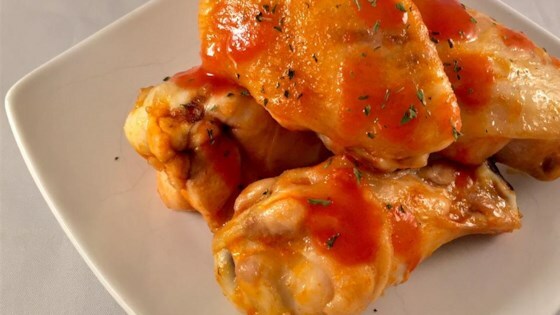 Make hot wings that taste like the famous restaurant chain’s. I used real butter in place of margerine, and onion powder in place of onion soup mix. This is a twist on a classic buffalo wing recipe. The basil is necessary! Finally found a sure-fire way to make wings. Baking at the end glazes the wings nicely. I'm going to finish them quickly on the grill next time for a little char. Great recipe! Awesome wing recipe! Everyone in my house loved them.